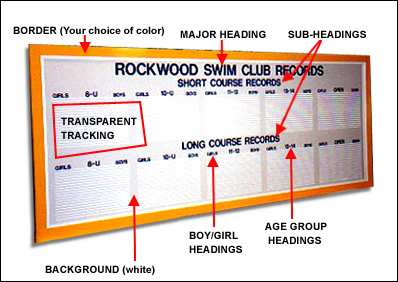 This page gives all the information needed to order a ThinTrack style board. We do not accept orders on Model B or C unless we have your approval on a scale diagram we have measured out on graph paper. (Model A orders can usually be described and formatted over the phone.) Please review the information and the photos on this site carefully to get ideas and define what you wish to display. Then select a board (and letter size) that best fits your needs. Call us if you have any questions and then follow the instructions below on "Getting a scale diagram". The cost for a diagram is $10 with the full amount going toward your board should you order one. This details the format, placement and layout of all records. Additional (revision) diagrams are also $10. A list of all the events for each age group (the names for each record are not needed) on a sheet of paper. The model of board and letter size you are intersted in. What your major heading (across the top) will read. See photo below. Please print the order form below, fill out completely, and mail with your check or purchase order for us to begin production. Please make sure you have received a current shipping/freight quote and have included it on the order form. We accept PO's from YMCA's, Boys/Girls Clubs, High Schools and Colleges only. If you do not have a purchase order we request a materials deposit (half the total cost) before we can begin production. We will mail a snapshot of the board when it is completed along with a bill for the remaining balance. The board will be shipped when we receive the remaining balance.